A letter expressing her desire to obtain small articles of handiwork for resale at a gift shop there. She asks for their help in acquiring some either through The Berry Schools or a school they might reference to her. 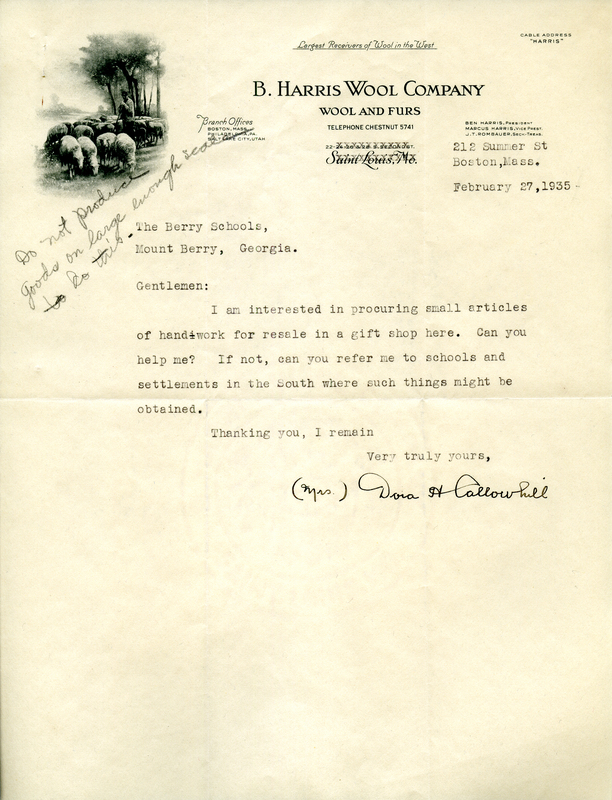 Mrs. Dona H Callowhill, “Letter to The Berry Schools from Mrs. Dona H Callowhill.” Martha Berry Digital Archive. Eds. Schlitz, Stephanie A., Jordan Brannen, Camille Hanner, Jessica Hornbuckle, et al. Mount Berry: Berry College, 2016. accessed April 24, 2019, https://mbda.berry.edu/items/show/14191.